Frida Kahlo's 'Viva la Vida'. October. 31, 2018 07:57. .
As Freud said, some get deeply traumatized by a train accident while others get over it shortly. The same goes with artists. Some artists are hit hard by trauma while others overcome it. Mexican artist Frida Kahlo is one of the artists who weather shocks. She contacted polio at the age of six. Twelve years later, she got the spine and pelvis broken due to a terrible car accident. Late in life, she lost one leg. A third of her self-portraits were drawn when she was in bed. Her life was full of pains and sufferings including more than 30 rounds of surgery, several miscarriages and the following complications. She was different than anyone else in that she rose stronger after a series of adversities. 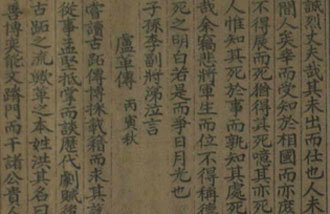 As the title “The Wounded Deer” implies, she did not give in to scars and sufferings, but did her best to honor dignity even with arrows stuck on the back. The glaring eyes of the deer – another shape of her own self – prove it. The drawing “Viva la Vida” tells more about her. The last piece of her collection was drawn just before she died in her mid-forties. The still life painting describes full-size and sliced watermelons, suggesting a completely different aspect of emotions from her gloomy life. She quenches the thirst for life by giving a watermelon onto the table: Come to quell your thirst. The shadows of death are not smeared over the painting, but only hospitality welcomes those thirsty. 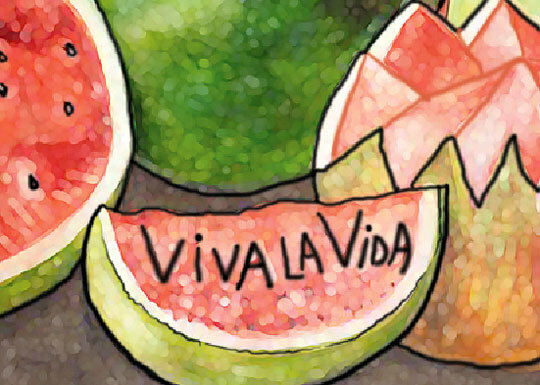 Not only with it, the phrase “Viva la Vida” writes on the red skin of a watermelon at the bottom-center of the drawing. What would have led her to draw watermelons that applaud life? Would it have been her love toward Mexico as an artist of native ancestry or cheer for revolution and the future? No matter what it was, it is sure that she possessed the will to power, as Nietzsche puts, that defies the scars and sufferings, and admires life.